Keeping you in the soup loop with this weeks fresh offerings! I’ve had a lot of requests for my Butternut Bisque as well as Corn & Red Pepper Chowder so they’re both on this week’s menu. In addition I’m making Tomato and Wild Rice Soup with fresh basil. This delicious vegetarian soup is perfect topped with Parmesan cheese, croutons or if you want to make it decadent, stir in a spoonful of creme fresh or sour cream! Also this week I’m making a vegan Broccoli and Potato Soup w/ Swiss Chard and red pepper flakes. This soup evolved from my Sicilian Great Grandmother’s creation - packed with vitamin C and K, broccoli and Swiss chard are great immune boosters; potatoes make it hearty and I add a few red pepper flakes for a bit of warmth. My Great Grandmother would generously top with Parmesan or Romano cheese and a drizzle of good olive oil. - soooo delish!! 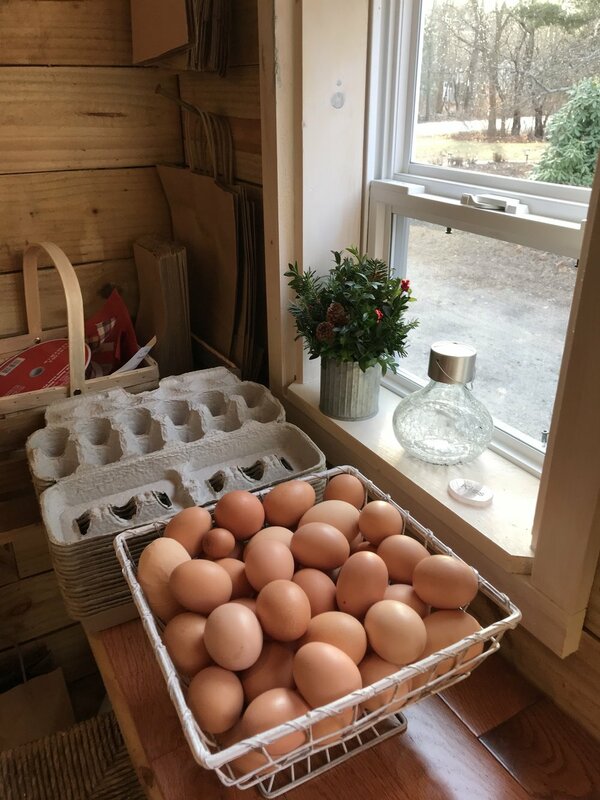 No Farmers Markets for us this week so we’ll be opening the Little Kiss Country Store FRIDAY FEBRUARY 8, from 3pm - 5pm and SATURDAY FEBRUARY 9, from 10am - 1pm for pickup. We will also have a selection of our jams and will be featuring our Jam Samplers which make the perfect little Valentine’s gifts! Please get orders in by WEDNESDAY FEBRUARY 6th to guarantee your fresh items! If you’re a marmalade fan come by during shop hours for a taste of our Orange Carrot Marmalade with fresh ginger. We’re making a fresh batch this week . Fresh whole organic oranges, carrots, and freshly juiced organic ginger root make this outstanding marmalade full of flavor and zip! 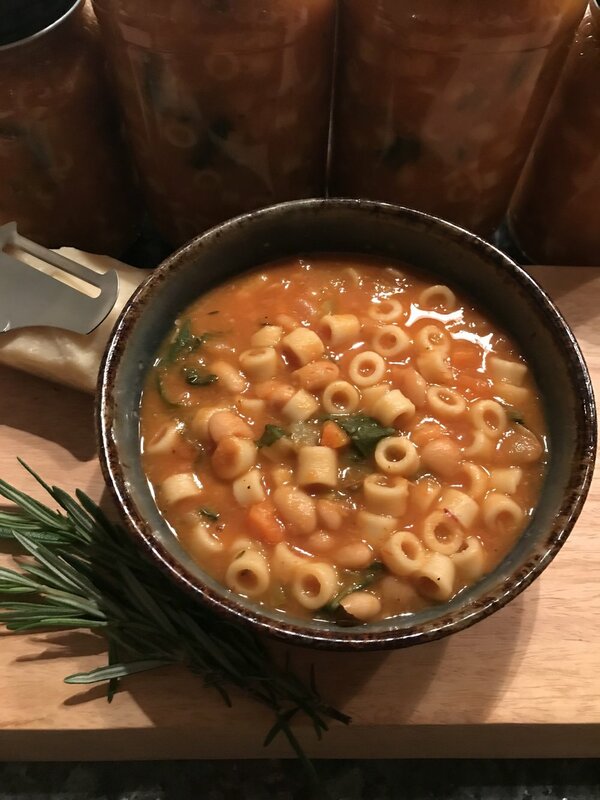 A recent visit with my dear friend Al Monaco reminded me that it’s been way too long since I’ve made Pasta e Fagioli, a classic Italian bean and pasta soup that is Al’s absolute favorite! Also finally got together with Josh from DaSilva Farms so I’ve got 16 lbs of his fantastic local pasture raised chicken which means Roasted Chicken Bone Broth is on! Customers know that bone broth is ridiculously good for you but they’re often at a loss as to how to serve it. A quick google will give you more quick and easy soup recipes than I could ever list here, but never underestimate the power of our bone broth to add flavor to rice or sauces! Personally I love it straight up with a sprinkle of sea salt - the perfect afternoon pick me up! If you need anything else like Jams or sea salt blends etc, I’d be happy to put those aside for you as well. Making a fresh batch of this relatively new flavor - this is my spiciest pepper jam so far! With red Thai bird chilis and fresh garlic, this spread has quite the kick and is perfect with soft cheeses! Other fantastic applications for this sweet hot combo include grilled cheese sandwiches, glaze for chicken or fish, warmed up it makes a fabulous dipping sauce for shrimp or chicken tenders, great sandwich spread or epic side for noodle or rice bowls!